GIVAT ZEEV, West Bank (AP) — The Beitar Shabi Givat Zeev players huddled around for a training session, lobbing soccer balls as an autumn evening breeze swept through the surrounding rocky hills. It was a routine scene played out on soccer fields around the world, but if Palestinian authorities have their way, the team could soon find itself permanently sidelined. Givat Zeev and other clubs based in Israeli West Bank settlements are at the center of a showdown between Israelis and Palestinians that is set to draw soccer's global governing body FIFA into a tense dispute over Mideast politics. The Palestinians are pushing FIFA to declare the teams illegal at a meeting in Switzerland next month. "All the Israeli activities in the occupied Palestinian territories are illegal, including sports," said Jibril Rajoub, the head of the Palestinian Football Association. "We are demanding that FIFA take a clear position and protect our sovereignty on our land." The Palestinians want the West Bank as part of their future state, along with the Gaza Strip and east Jerusalem. The international community overwhelmingly opposes the settlements as illegal or illegitimate obstacles to peace. The Palestinians have for years made a series of soccer-related complaints against Israel over travel delays for Palestinian players caused by Israeli security restrictions. Rajoub last year led an unsuccessful drive to have Israel suspended from FIFA over various issues, including the settlement clubs. Next month, a monitoring committee will present its recommendations over the teams at a FIFA meeting in Zurich. The Palestinians hope the organization will take a tough stance against the settlements and their soccer clubs. The Palestinians say the Israel Football Association is breaking FIFA rules that bar a member association from holding games on another member's territory without permission. They are basing their claim on a 2012 U.N. General Assembly vote that gave Palestine non-member state status at the United Nations and recognized the West Bank as Palestinian land. Israel has rejected the Palestinian campaign as an attempt to politicize sports and has cited security concerns as the reason behind the occasional restrictions placed on Palestinian players, particularly in the Hamas-ruled Gaza Strip. Following the suspension attempt, both sides agreed to a compromise that included international monitoring on Israel's actions toward Palestinian soccer players and more scrutiny for the settlement clubs. With the Oct. 13 FIFA meeting approaching, a FIFA spokesperson said there had been "marked progress" regarding security-related delays but that the question of settlement clubs was still under discussion. Shlomi Barzel, spokesman for the Israel Football Association, said the Israeli and Palestinian soccer associations operate according to interim peace accords from the 1990s that divided the West Bank into areas controlled by Israel, including the settlements, and the Palestinian Authority. He said it wasn't up to FIFA to determine what territory belongs to whom. "With all due respect, FIFA is not the United Nations," he said. He said banning the settlement clubs, which are made up of amateur adult and youth teams, would largely affect children and that while holding the games in Israel proper was possible in theory, doing so could have far-reaching political implications. Ahead of the FIFA meeting, Human Rights Watch released a report Monday accusing the international soccer federation of sponsoring matches on land illegally taken from Palestinians. The group is demanding that FIFA require the Israel Football Association to move all games played in the settlements to within Israel proper. "By holding games on stolen land, FIFA is tarnishing the beautiful game of football," said Sari Bashi, Israel and Palestine country director at Human Rights Watch. "FIFA should step up now to give settlement clubs a red card and insist the Israel Football Association play by the rules." The report says the settlement games perpetuate a dire situation in the West Bank. They help the settlements' economy and highlight the deep physical divisions between Israelis and Palestinians. Palestinians are not allowed in settlements without a permit and cannot attend games there. Using geographic information system technology and maps obtained by the Israeli anti-occupation group Kerem Navot, the report said that two fields used by the settlement clubs have been built on privately owned Palestinian land. Two other fields appear to have been cultivated before being seized by Israel, an indication that they too may be located on private land. Among the fields is the Givat Zeev pitch, which the report says was built on land "taken without permission and rendered off-limits to its owners" after Israel built the settlement. 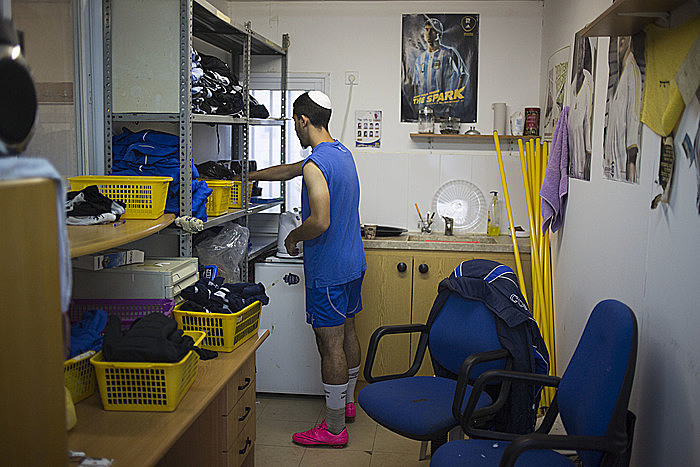 High-rises from the nearby Palestinian city of Ramallah poke over a ridge surrounding the soccer field, where an adult team, clad in fluorescent cleats and blue uniforms adorned with a menorah, trained ahead of their first game of the season. Earlier, a team of 10-year-olds scurried around the field. Gabi Perez, the club's founder, said soccer provides dozens of local children with an opportunity to have fun, teaches them discipline and teamwork and keeps them away from mischief. "Let's say FIFA shuts us down, what will (Rajoub) have achieved?" Perez said. "Let us educate the children, so they don't end up on the street." Perez said he was unaware of the land ownership claim by Salah al-Din al-Qurt, a 67-year-old Palestinian who says the Israeli military confiscated his property in the 1970s, when Givat Zeev was built. Years later, he found out a soccer field stretches over the land he used to cultivate. "This is oppression in its ugliest state: others enjoy your place and you struggle to live," said al-Qurt. "Settlers should be banned from enjoying the properties they stole."